Practically ever since JJ was born I’ve thought that some sort of sport would be good for him. Well not just for him, for practically any kid. As he’s become older and I’ve seen he is very active and can’t sit still for very long it’s confirmed my belief that sport would be good for him. Organised sports for kids don’t seem to start here until they’re about seven or eight but there are plenty of programs they can do to get their feet wet. Until now, none of them suited me because I couldn’t take him or because they were too early on a Sunday morning. I do realise that if he does continue with sport it won’t always be convenient, but at this stage of his life it needs to suit both of us so we have some chance of continuing. So last week we went along to a basketball program that Aussie Hoops organises. It’s for kids aged 5-12 with some or no experience in basketball, it was at a convenient time so off we went. 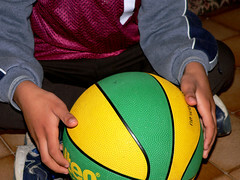 The registration included their very own basketball and a basketball singlet. This is a stroke of genius, or just commonsense, on their part because with their very own basketball and uniform they can look and act like a basketballer after class is over. The class goes for 45 minutes and they start of with simple exercises like walking up and down the court bouncing the ball. They then practised throwing hoops (JJ got a couple in by the way), and then they had a game. This was the entertaining part of the whole thing. I sat on the sidelines nearly wetting myself laughing. A couple of kids had some idea what they were doing but most of them didn’t so I couldn’t see the ball for all the kids trying to get it. JJ was about the only one who didn’t get in amongst the action, but stood outside the back with his arms spread wide so the ball wouldn’t get past him. He’ll make a good defence person (I don’t know the correct terminology here). 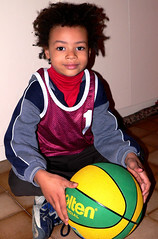 Not that I want to throw my expectations upon him, but I think he’ll be good at basketball. I’m pretty sure he’ll be tall enough. His dad is 6 foot 6 and JJ has always been near the 100th percentile for his height. Suffice to say that JJ really enjoyed himself and can’t wait to go back next week. All weekend I had to put up with a bouncing ball sound outside the house and we found some basketball rings in the area and shot some hoops with each other. So it’s a good mother and son bonding exercise too. Have you participated in the All Women Blogging Carnival this week? Also I’m offering one person a chance at getting a new webblog banner. Last Friday I decided I would go to see a movie by myself – a rare pleasure in my life. I wanted to see the new Harry Potter film but it finished past the 3pm deadline so I saw the new Simpsons movie. I’m a big fan of The Simpsons and try to catch the new episodes when they’re aired on television here. Unfortunately Channel 10 shows repeats all the time so it’s not always easy to tell which episodes are new and which aren’t. I did wonder how the transition from half hour show to one and a half hour movie would pan out but the time flew while I was in there which is a good sign. There was a story to carry the audience through this extra time and many references to the fact that we were watching a movie, eg Bart writing on the blackboard at the beginning of the show ‘It is illegal to download movies’. There were also many other references to movies including a movie within a movie at one stage. I wondered if they would follow the same formula in the tv shows where there is a lead in to the main story that really has nothing to do with the main story even though they kind of connect, but this wasn’t the case. There were some things we’ve never seen before from the characters like Lisa having a love interest and Bart valuing Flanders as a father figure. I enjoyed the experience and I think there will be a sequel. When you watch it stay for the credits is all I will say. I’m the hostess with the mostest this week because I’m hosting the All women blogging carnival. It’s very simple to take part in this carnival. You just have to be a woman and you just have to be a blogger. You can submit a new or previous blog post by filling in the Mr Linky form below (if reading via feed reader you need to click to website to view Mr Linky). Make sure you post a permanent link to your post. If you post a link to your blog homepage anyone clicking on the link below won’t know which article you’ve submitted for this particular carnival. Last, but by no means least read the posts of other participants. I’ve kicked it off with a post from me. JJ has his photo on the Crazy Hip Blog Mamas website. They put a call out for a photo to be featured on their website with the theme rockin’ out for their Photo Friday. I knew just the one I would send in. It was taken as I was preparing for my 40th last year. JJ got caught up in all the excitement and just had to rock out in the backyard. Actually at the time it felt like he was running around like a maniac but time has a tendency to change memories a little bit and now I’ll look at it as though he was rocking out and having a damn good time. I don’t have any particular schedule for when I change my blog banner but today is the day. When looking back through all the old ones I can see that my graphic design skills aren’t that great, but I think there has been an improvement over the three years I’ve been doing this blog. As usual I add my old one for posterity (click to view full image). When I update my blog banner I choose a colour I like from it for my text link colours and change them also. I usually just change the link colour and the active link colour (the colour that you see when you hover over a link). This is fine for the text in my actual blog but it also now involves changing link colours in a couple of widgets I have also. Luckily I’m somewhat familiar with HTML so this makes my job a lot easier. Are you bored with your blog banner? Do you want a new one? If you want, I’m willing to do you a new one and help you implement it if the thought of getting your hands dirty in your blog scares you silly. I’m only offering this for one person, so plead your case in my comments and I’ll pick my favourite out of the comments and then work with you to design a new banner. You have one week from today, so last comments in by midnight Friday 17 August my time, that’s GMT +9.30 hours. (I’ve extended the deadline because I’ve had no takers yet even though people who’ve commented reckon it’s a great idea). Disclaimer: I’m not a graphic designer, just a dabbler in Photoshop. If you want a professional graphically designed blog banner, then this offer isn’t for you. With particular emphasis on moronic in my title, our esteemed Australian government brought in WorkChoices legislation in March 2006. It is an oxymoron because there are not really any choices in the updated Workplace Relations Act. In fact, it took a lot of choice and money away from many workers – mostly from workers who could ill afford it. provides more choice and flexibility for employers in the workplace. balance work and family life." provides more choice and flexibility for employees in the workplace. receive greater rewards and incentives." Interestingly, especially for employees, this is not how it works. A study has just been released Not fair, No choice – The impact of WorkChoices on twenty South Australian workers and their households (PDF file). It clearly outlines the negative impact WorkChoices has had on their work. "Shannon is also a sole parent with children 8 and 11 years old. She had shifted from one country town to another in mid-2006 in order to obtain work as a permanent full-time bar manager on an individual contract. She worked a split shift Monday, Tuesday, Thursday and Friday, commencing at 10am, with a break between 1pm and 5.30pm, then working until close of business. On Saturday she worked 5.30pm until close. On Sunday she worked four hours in the morning. She was paid $15.97 per hour. If you have been affected by WorkChoices you are able to participate in a confidential interview. See page 72 of the report for further information. I remember at my workplace when this legislation came into effect I recommended to the team that they should all join the union. I’ve been a union member since I started at my workplace in 1994 and have been lucky enough not to have really needed them but I hope they would be helpful if I did. Everyone was quite apathetic about it and I don’t think anyone did join. We have been pretty lucky here in that we are not directly affected by this legislation because we have an Enterprise Agreement which the unions help get for us by the way. ensure workplace laws are fair, balanced and productive." I don’t think my title is very good English but that’s how it got typed. A blog I discovered the other day via Problogger is Bloggrrl. She’d written a funny article about 10 tips to lose that extra blog weight which caught my interest and I instantly subscribed to her blog. I’m still subscribed so she hasn’t bored me yet. She also masquerades as Bizgrrl and has some useful articles about blogging and associated things, offered up in an interesting, sometimes funny, and easy to read format. Anyway, she’s having a contest called Cow Pattie Bingo and giving away some money to the winner and everything. By writing this post I’ve satisfied the entry criteria and I wonder if I get an extra entry for being extra nice, or maybe just a kiss because she gives those away too?